Enjoy delicious grilled food anytime, regardless of weather. Cook the healthy way with a raised grid grilling surface. Cooking fat drips away from food and into the removable drip tray. 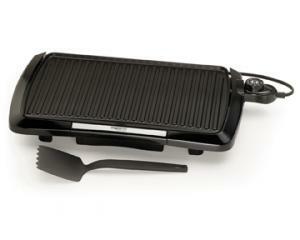 Cool touch base surrounds the grilling surface on the front and both sides. Heavy cast aluminum base and premium nonstick surface ensure stick-free cooking and easy cleaning. Control Master heat control automatically maintains the desired cooking temperature. *Fully immersible and dishwasher safe with the heat control removed. Includes a specially designed spatula/scraper.